2 Financial Services (Moneylending) ARRANGEMENT OF SECTIONS. Section 1. Short title. 2. Interpretation. 3. Re-opening of transactions of moneylender. 4. Presumption that interest is excessive. 5. Licences to be taken out by moneylenders. 6. Certificate required for grant of moneylender s licence. 7. 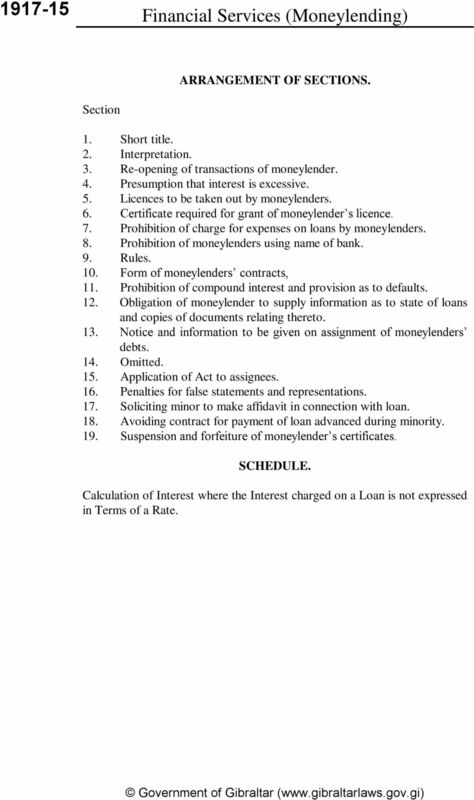 Prohibition of charge for expenses on loans by moneylenders. 8. 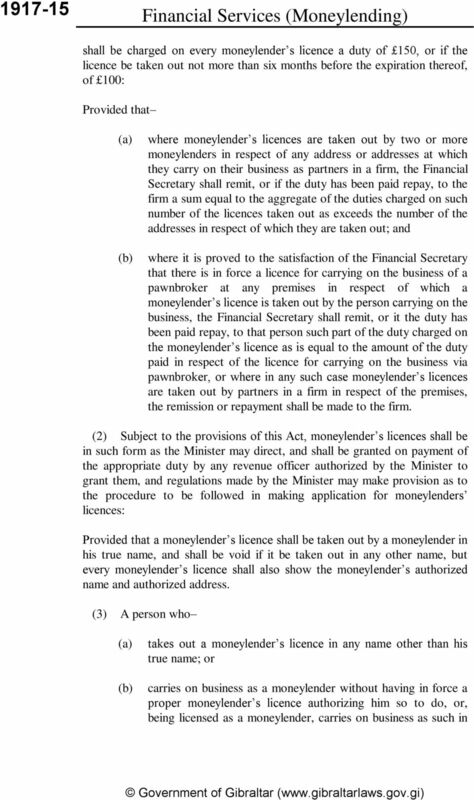 Prohibition of moneylenders using name of bank. 9. Rules. 10. 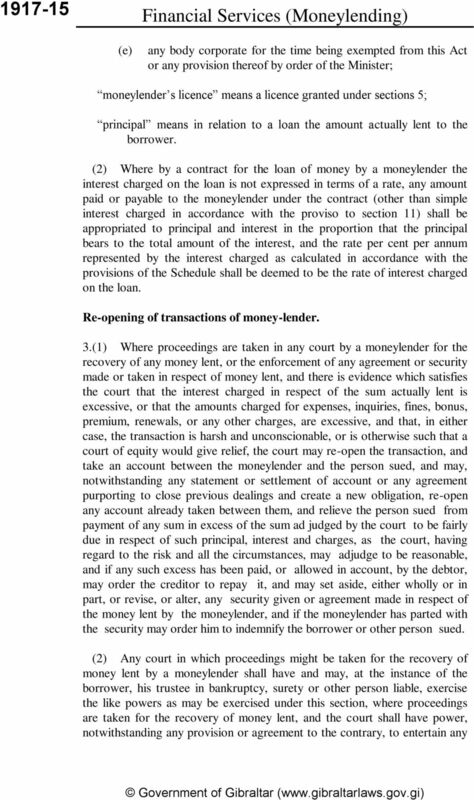 Form of moneylenders contracts, 11. Prohibition of compound interest and provision as to defaults. 12. 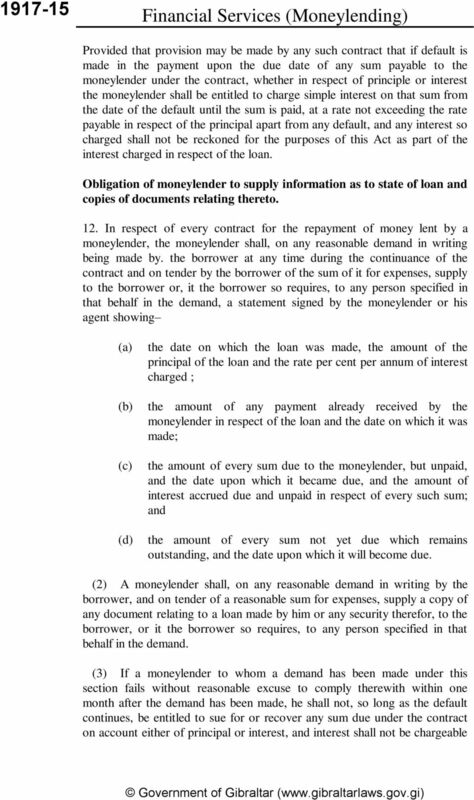 Obligation of moneylender to supply information as to state of loans and copies of documents relating thereto. 13. 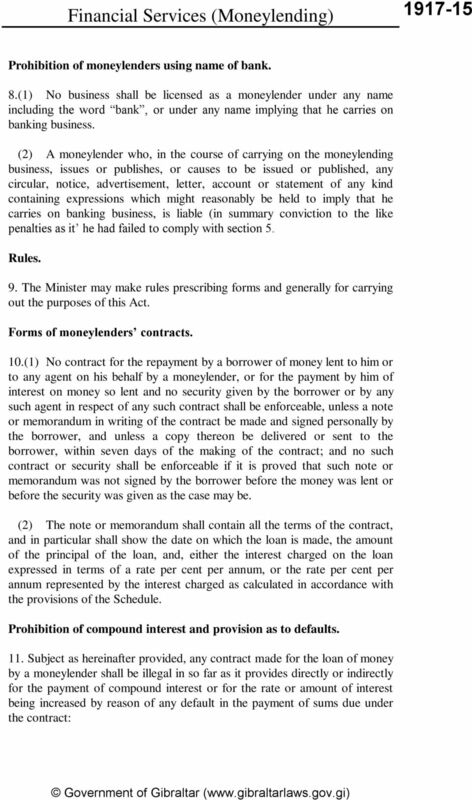 Notice and information to be given on assignment of moneylenders debts. 14. Omitted. 15. Application of Act to assignees. 16. Penalties for false statements and representations. 17. Soliciting minor to make affidavit in connection with loan. 18. Avoiding contract for payment of loan advanced during minority. 19. Suspension and forfeiture of moneylender s certificates. SCHEDULE. Calculation of Interest where the Interest charged on a Loan is not expressed in Terms of a Rate. 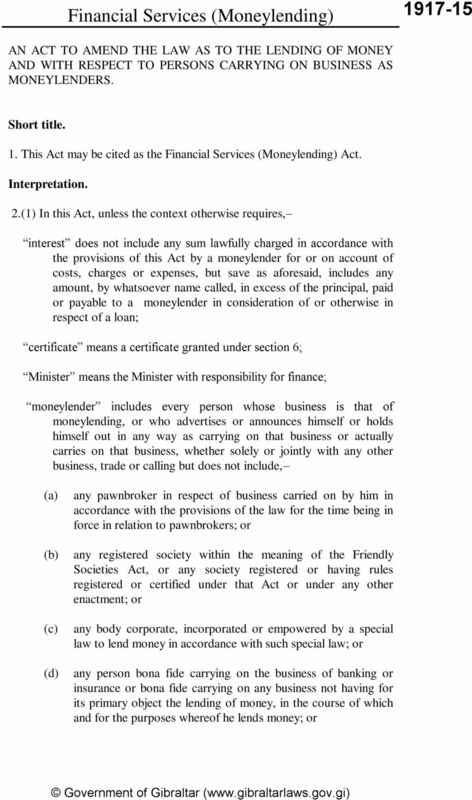 8 Financial Services (Moneylending) moneylender under this Act and under the Business Names Registration Act. (4) A certificate shall come into force on the date specified therein, and shall expire on the next following 31st day of December. (5) The Minister shall make rules with respect to the procedure to be followed in making applications for certificates (including the notices to be given of intention to make such an application), and certificates shall be in such form as may be prescribed by rules so made. (6) A certificate shall not be refused except on some one or more of the following grounds: (c) (d) that satisfactory evidence has not been produced of the good character of the applicant, and in the case of a company of the persons responsible for the management thereof; that satisfactory evidence has been produced that the applicant, or any person responsible or proposed to be responsible for the management of his business as a moneylender, is not a fit and proper person to hold a certificate; that the applicant, or any person responsible or proposed to be responsible for the management of his business as a moneylender, is by order of a court disqualified for holding a certificate; that the applicant has not complied with the provisions of any rules made under this section with respect to applications for certificates. (7) Any person aggrieved by the refusal of the Minister to grant a certificate may appeal to the Supreme Court on a point of law. 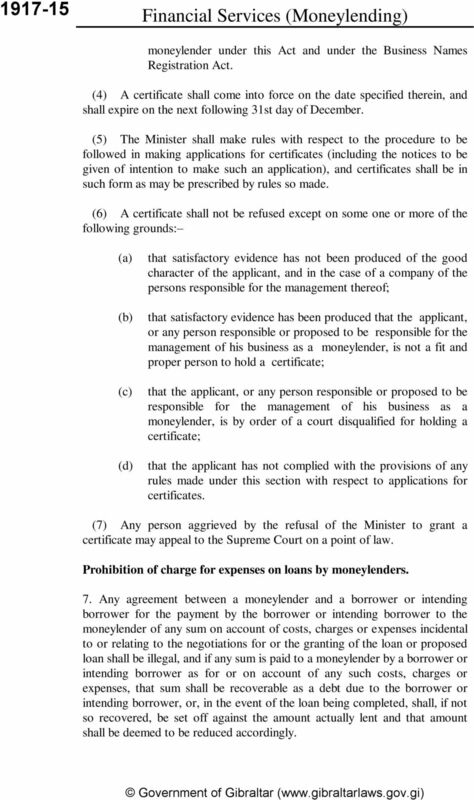 Prohibition of charge for expenses on loans by moneylenders. 7. 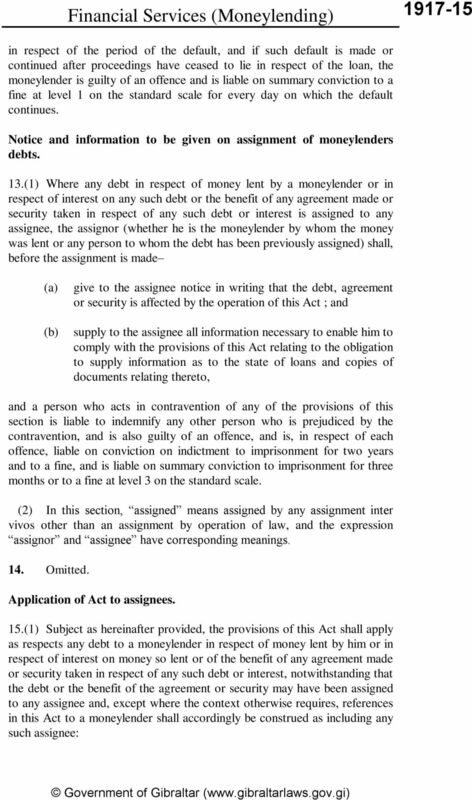 Any agreement between a moneylender and a borrower or intending borrower for the payment by the borrower or intending borrower to the moneylender of any sum on account of costs, charges or expenses incidental to or relating to the negotiations for or the granting of the loan or proposed loan shall be illegal, and if any sum is paid to a moneylender by a borrower or intending borrower as for or on account of any such costs, charges or expenses, that sum shall be recoverable as a debt due to the borrower or intending borrower, or, in the event of the loan being completed, shall, if not so recovered, be set off against the amount actually lent and that amount shall be deemed to be reduced accordingly. 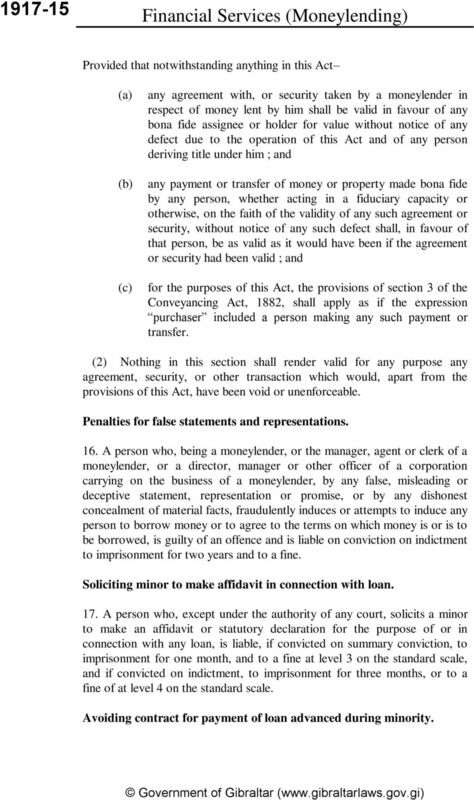 12 Financial Services (Moneylending) Provided that notwithstanding anything in this Act (c) any agreement with, or security taken by a moneylender in respect of money lent by him shall be valid in favour of any bona fide assignee or holder for value without notice of any defect due to the operation of this Act and of any person deriving title under him ; and any payment or transfer of money or property made bona fide by any person, whether acting in a fiduciary capacity or otherwise, on the faith of the validity of any such agreement or security, without notice of any such defect shall, in favour of that person, be as valid as it would have been if the agreement or security had been valid ; and for the purposes of this Act, the provisions of section 3 of the Conveyancing Act, 1882, shall apply as if the expression purchaser included a person making any such payment or transfer. (2) Nothing in this section shall render valid for any purpose any agreement, security, or other transaction which would, apart from the provisions of this Act, have been void or unenforceable. Penalties for false statements and representations. 16. A person who, being a moneylender, or the manager, agent or clerk of a moneylender, or a director, manager or other officer of a corporation carrying on the business of a moneylender, by any false, misleading or deceptive statement, representation or promise, or by any dishonest concealment of material facts, fraudulently induces or attempts to induce any person to borrow money or to agree to the terms on which money is or is to be borrowed, is guilty of an offence and is liable on conviction on indictment to imprisonment for two years and to a fine. Soliciting minor to make affidavit in connection with loan. 17. A person who, except under the authority of any court, solicits a minor to make an affidavit or statutory declaration for the purpose of or in connection with any loan, is liable, if convicted on summary conviction, to imprisonment for one month, and to a fine at level 3 on the standard scale, and if convicted on indictment, to imprisonment for three months, or to a fine of at level 4 on the standard scale. Avoiding contract for payment of loan advanced during minority. 13 18. (1) If a minor who has contracted a loan which is void in law, agrees after he comes of age to pay any money which in whole or in part represents or is agreed to be paid in respect of any such loan, and is not a new advance, such agreement. and any instrument, negotiable or other, given in pursuance of or for carrying into effect such agreement or otherwise in relation to the payment of money representing or in respect of such loan shall, as far as it relates to money which represents or is payable in respect of such loan, and is not a new advance, be void absolutely as against all persons whomsoever. 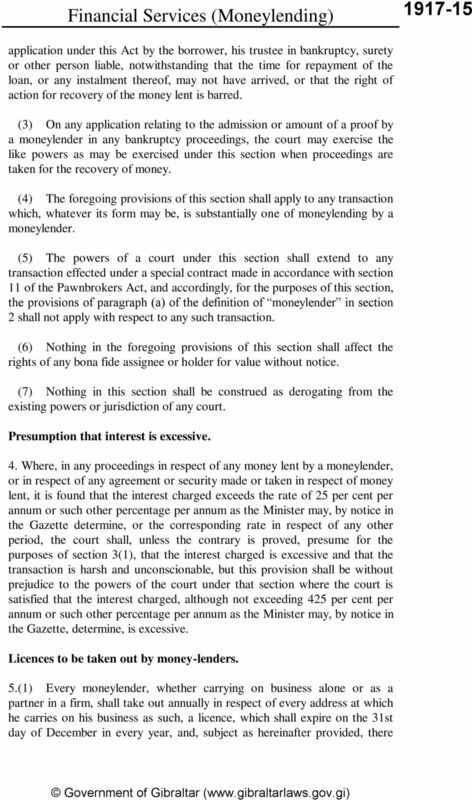 (2) For the purposes of this section any interest, commission or other payment in respect of such loan shall be deemed to be a part of such loan. 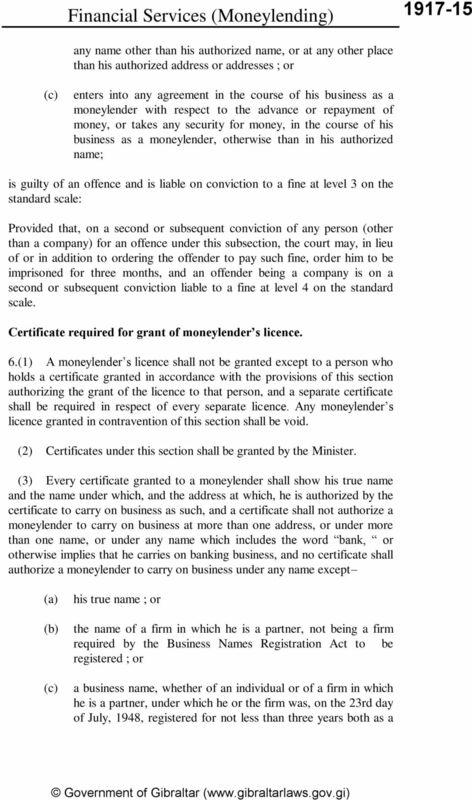 Suspension and forfeiture of moneylenders certificates. 19. (1) Where any person, being the holder of a certificate, is convicted of any offence against this Act, the court may order that any certificates held by that person. 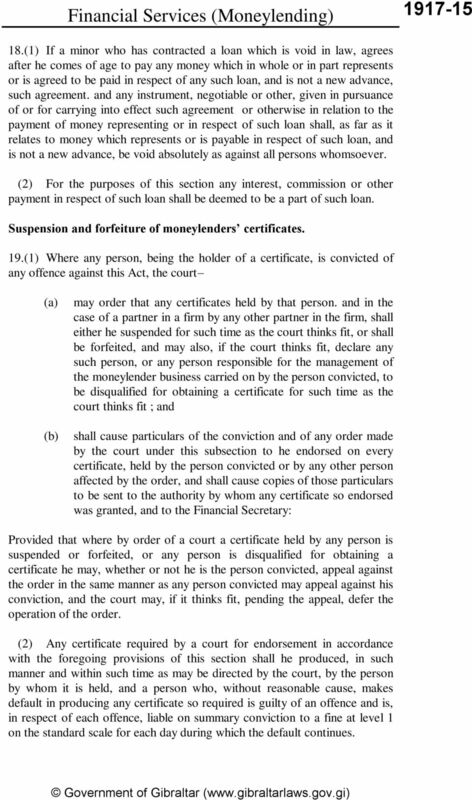 and in the case of a partner in a firm by any other partner in the firm, shall either he suspended for such time as the court thinks fit, or shall be forfeited, and may also, if the court thinks fit, declare any such person, or any person responsible for the management of the moneylender business carried on by the person convicted, to be disqualified for obtaining a certificate for such time as the court thinks fit ; and shall cause particulars of the conviction and of any order made by the court under this subsection to he endorsed on every certificate, held by the person convicted or by any other person affected by the order, and shall cause copies of those particulars to be sent to the authority by whom any certificate so endorsed was granted, and to the Financial Secretary: Provided that where by order of a court a certificate held by any person is suspended or forfeited, or any person is disqualified for obtaining a certificate he may, whether or not he is the person convicted, appeal against the order in the same manner as any person convicted may appeal against his conviction, and the court may, if it thinks fit, pending the appeal, defer the operation of the order. (2) Any certificate required by a court for endorsement in accordance with the foregoing provisions of this section shall he produced, in such manner and within such time as may be directed by the court, by the person by whom it is held, and a person who, without reasonable cause, makes default in producing any certificate so required is guilty of an offence and is, in respect of each offence, liable on summary conviction to a fine at level 1 on the standard scale for each day during which the default continues. 14 Financial Services (Moneylending) (3) Where a certificate held by any person is ordered to be suspended or to be forfeited under the foregoing provisions of this section, any moneylender s licences granted to that person, whether in pursuance of that or any other certificate, shall be suspended during the period for which the certificate is ordered to be suspended or become void, as the case may be. 15 SCHEDULE. Sections 2(2) and 10(2). CALCULATION OF INTEREST WHERE THE INTEREST CHARGED ON A LOAN IS NOT EXPRESSED IN TERMS OF A RATE. 1. The amount of principal outstanding at any time shall be taken to be the balance remaining after deducting from the principal the total of the portions of any payments appropriated to principal in accordance with the provisions of the Act. 2. The several amounts taken to be outstanding by way of principal during the several periods ending on the dates on which payments are made shall be multiplied in each case by the number of calendar months during which those amounts are taken to be respectively outstanding, and there shall be ascertained the aggregate amount of the sum so produced. 3. The total amount of the interest shall be divided by one-twelfth part of the aggregate amount mentioned in paragraph 2 of this Schedule, and the quotient, multiplied by one hundred, shall be taken to be the rate of interest per cent per annum. 4. 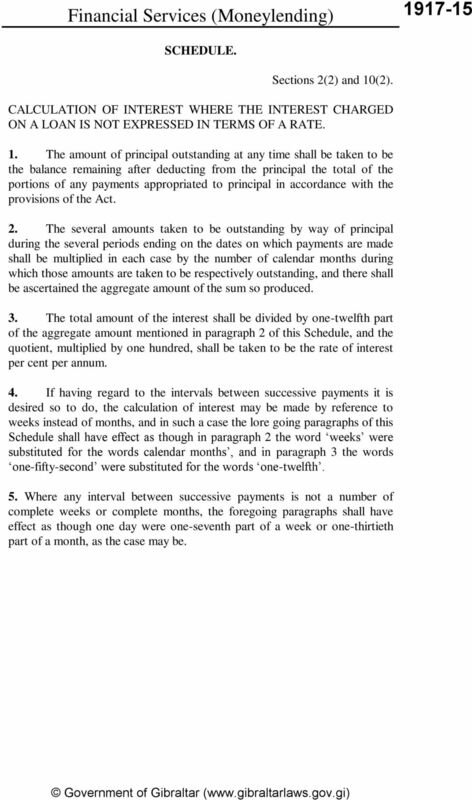 If having regard to the intervals between successive payments it is desired so to do, the calculation of interest may be made by reference to weeks instead of months, and in such a case the lore going paragraphs of this Schedule shall have effect as though in paragraph 2 the word weeks were substituted for the words calendar months, and in paragraph 3 the words one-fifty-second were substituted for the words one-twelfth. 5. Where any interval between successive payments is not a number of complete weeks or complete months, the foregoing paragraphs shall have effect as though one day were one-seventh part of a week or one-thirtieth part of a month, as the case may be. 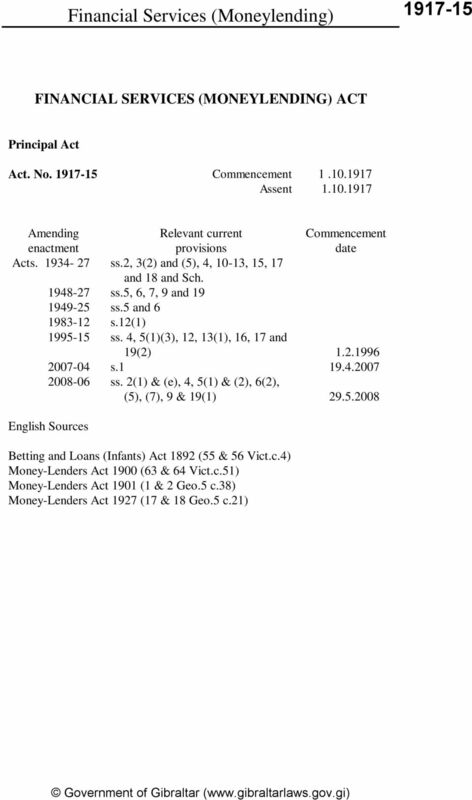 CHAPTER 273 THE MONEYLENDERS ACT. Arrangement of Sections. 24 GEO. V.] M oney-zenders Amendment [1933, No. 21. 121 New Zealand. ANALYSIS. Title. 1. Short Title. 2. Annual license fees payable by money -lender. 3. Duration of registration of moneylender. Repeal. Copyright @ Ministry of Law, Justice and Parliamentary Affairs, Bangladesh. 386 Volunteers Employment Protection 1959, No. 42 Title 1. 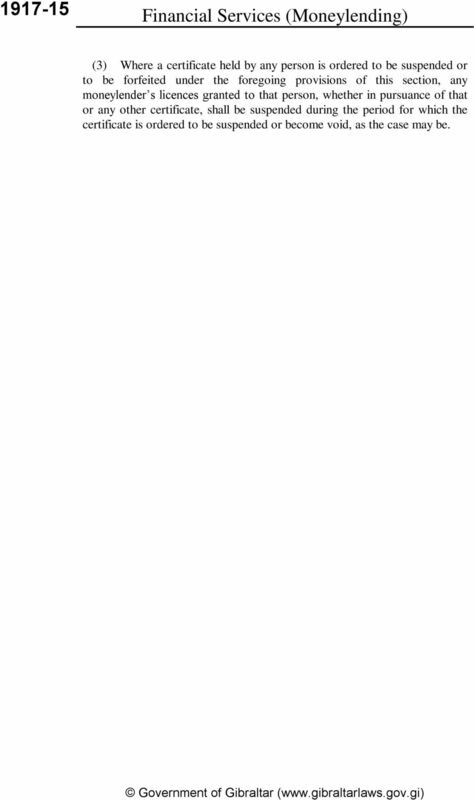 Short Title 2. Interpretation Leave of Absence For Period of Service or Training 3. Worker deemed to have leave of absence from employment 4.